Peacock Commons serves young parent families and young adults ages 18 – 24. For more information or to be placed on a wait list, please call (408) 907-4687. Peacock Commons is a 28 unit apartment complex that provides affordable, permanent, supportive housing to young adults and young parent families. This includes youth who are chronically homeless, at-risk of becoming homeless, aging out of foster care, or victims of domestic violence. 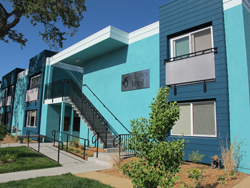 A unique component of Peacock Commons is the inclusion of affordable housing for six mentors who live on the premises and serve as role models for the residents and help facilitate activities. We've kept a video diary of the renovation process Peacock Commons underwent prior to opening in May of 2012. Please feel free to peruse the videos on our Peacock Commons YouTube channel for a peek at just how much work went into this project.